Well, hello there readers. My name is Seth Cross, though I commonly go by “DM” (and yes, it does stand for Dungeon Master.) I have played Magic: the Gathering on and off since I was 8 years old, nearly 20 years ago. For the past four years, I became obsessed with the Commander format and played what feels like hundreds of different decks. One of my favorite themes is tribal, so when Wizards of the Coast announced that Commander 2017 was going to be based on tribes instead of colors, they caught my full attention. Each year, the Commander product comes out with three possible Legendary creatures that can lead the deck. The “face card” is the general the deck is built around and portrayed on the packaging. Meren, Kaalia, Derevi, Daretti, etc. However, each deck has two other new Legendary Creatures that have unique abilities that sometimes do not mix as well with how the precon is designed to work. So how do we judge these “replacement” generals? We analyze them and build a deck specifically for them, of course. The goal is to show different strategies for each Commander while using EDHREC to look for previously printed cards that gain new life with these new abilities. Mathas, Fiend Seeker is one of the replacements for the Mardu-colored Vampiric Bloodlust. 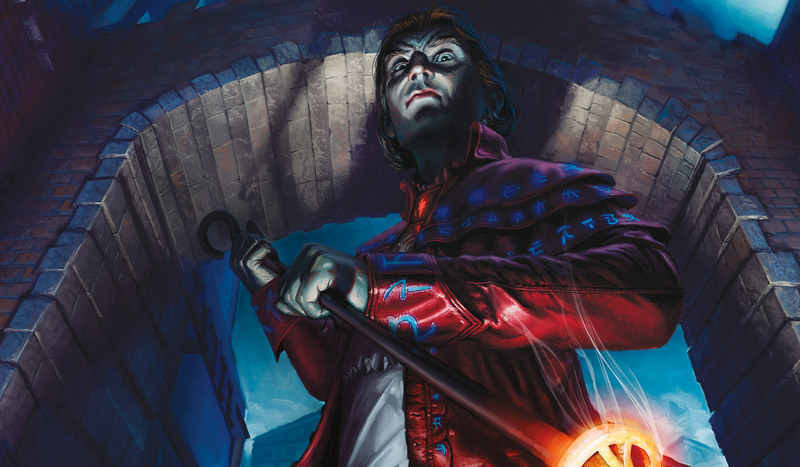 Overall, I see nothing wrong with putting him in the deck’s Command Zone, though Edgar Markov, the Eminence face card, is stronger leading a tribal vampire strategy. Despite being a vampire himself, Mathas does not synergize specifically with other vampires except in his color identity. His abilities are more unique and create an entirely different kind of theme. We will start by breaking him down. Mardu-colored decks have a range of themes. Zurgo Helmsmasher is a Voltron one-shot deck that wins via commander damage, and quickly. Queen Marchesa (long may she reign), however, prefers a pillow-fort strategy that grinds out value using her monarchy. Looking at Mathas, we see that he can do either of these strategies. With his stats coming in at 3/3 for three mana, the plan is to get him out early. Add the fact that he has evasion with menace, and there is potential to build him to hit and deal twenty-one damage. With his bounty-slinging ability, however, there is the option to play a more political role by placing bounty counters on unwanted creatures and incentivize the table with a reward for taking care of business. Of course, if we cannot trust the table to help, there is always the option to go for a more board-control strategy and handle things ourselves. NOTE: Path of Ancestry can come out of any deck that doesn’t plan on casting 15 or more vampires. It is recommended for him because currently, he’s being put in the command zone for many tribal vampire decks. Maybe we just want to smash face and deal out that sweet 21 damage. There are a couple of ways to accomplish this; equipment or counters. Vorrac Battlehorns makes him unblockable, while Cranial Plating can give a lot of power and Conqueror’s Flail offers a bit of control by denying opponents the ability to cast spells during our turn. Argentum Armor buffs Mathas and grants the ability to target a creature with a bounty counter on it to destroy when he attacks. Couple this with Blade of the Bloodchief and attack, destroy the bounty creature, draw a card and gain 2 life, then put two +1/+1 counters on Mathas before he hits. When thinking of recursion, Daretti, Scrap Savant and Trading Post would be auto-includes in any artifact aggro Deck. For new cards, Hammer of Nazahn fits well into the deck so that equipment can be cast and auto-equip for free when they enter the battlefield. We’re going to have to remove most of the enchantments from the generic deck to make room for these cards, as well as Darksteel Plate, Fireshrieker, Infiltration Lens, Sword of the Animist, Sram, Senior Edificer, Stoneforge Mystic, Puresteel Paladin and Godo, Bandit Warlord. If Artifacts are not the preferred method, however, there is another path. Innistrad vampires are notorious for building up with +1/+1 counters and this strategy is just as viable with Mathas. Rakish Heir will give Vampires counters every time they hit an opponent. So will Mephidross Vampire and Stensia Masquerade, which also give other vampires first strike. Cathars’ Crusade makes the entire field stronger with each creature that enters the battlefield. Curse of Stalked Prey keeps a bit of the political nature of the Bounty ability by encouraging others to attack someone else instead of us. Let us not forget Drana, Liberator of Malakir can give all her fellow attacking creatures a quick boost before they hit, via first strike and her triggered ability. Or cast a Boros Charm and give Mathas double strike after no blockers are declared and suddenly, one opponent is one-shot and out of the game. To speed things up, Bloodsworn Steward gives commander creatures +2/+2 and haste, meaning that even if he is removed, casting him again means the damage can start all over again. Since we’re dealing in counters, I made room for Abzan Battle Priest, Abzan Falconer, Ainok Bond-Kin, Mer-Ek Nightblade, Indulgent Aristrocrat and Citadel Siege by going lighter on the removal spells from our generic list. Some players prefer mind games and politics. The ability to mark cards for a reward means we can direct more than just react. The goad mechanic from Conspiracy: Take the Crown fits well with this strategy, because not only can we prevent people from attacking us, but we can try to manipulate combat to result in bountied creatures dying. Grenzo, Havoc Raiser can play puppet master here by sitting back without attacking and letting the more evasive Mathas sneak in with Menace and set our schemes into motion. The new card Disrupt Decorum causes chaos in mid to late game, especially with multiple bounties on the field. Goblin Diplomats can incite some combat as well, but we should be careful that the player forced to attack does not direct everything in our direction. Defensive cards like Ghostly Prison, Teysa, Envoy of Ghosts, Windborn Muse and Hissing Miasma are useful in deterring this kind of revenge attacking. The new card Stalking Leonin seems like it could be fun in these situations if it is played it beforehand and can predict which opponent will be forced to attack. Putting a Crown of Doom into play and letting enemies bicker over who must hold the spiked crown is a great way to wage chaos and war. Tyrant’s Choice is another fun card because a political player can leave the ultimate decision up to their opponents and encourage the vote if it means an opponent will be forced to sacrifice a Bountied creature. It is important to remember that a certain amount of “table talk” may be required to let this strategy shine. Simply controlling the board can make someone look like a tyrant, so it is better to appear to be the benevolent ruler, offering opportunities and rewards to our fellow players while secretly building up for the victory. This list closest resembles the generic list, but we did want to also make room for some additional defenses with Norn’s Annex and Aura of Silence and again going lighter on the targeted removal the generic list came with. Some people are not skilled in the arts of deception and persuasion. Some people are calculating, ruthless, and more than willing to do their own dirty work. Thus, we look at a more board-control strategy for our favorite Fiend Seeker. Mardu has many token generators and sac outlets that can be abused with either Grave Pact or Dictate of Erebos on the field. Passing the turn and putting a Bounty on a creature and then sac’ing a token to Viscera Seer and forcing the Bountied creature to be sacrificed can be extremely beneficial. Since the rest of the table is still drawing cards and gaining life, they may even let these shenanigans continue into the mid or late game. Creating tokens is easy with cards like Grave Titan, Endrek Sahr, Master Breeder, Assemble the Legion and even White’s Sun Zenith. If we want even more value out of our tokens dying, throw in Blood Artist and Deathgreeter for some incremental life gain and damage. Purphoros, God of the Forge is a strong card for token strategies, but something like this is a bomb card and may draw unwanted attention to our side of the board, so be careful. Another hidden gem from EDHREC is Kulrath Knight, which pacifies our opponents’ creatures with counters on them. A perfect strategy for placing bounties on the biggest threats on the field. To truly control the board, we need to make room for Karmic Justice and add some extra recursion with Palace Siege for when we need to sacrifice our nontoken creatures. When the vampires were spoiled, I instantly took a shine to Lord Edgar Markov (I know his printed name does not say “Lord”, but c’mon, he is the father of all vampires on Innistrad.) because he is everything I expect from a tribal vampire commander. He creates an army, he makes his army more dangerous and he wants to strike for the win. The more I looked at Mathas, though, the more I truly began to admire his diversity. I believe someone could build three or four different decks, all with the Fiend Seeker at the helm and each one would be strong, consistent, fun to play and very unique. Wizards of the Coast did a great job with this card and I look forward to seeing more Legendary Creatures like this one. One down, seven more replacements to go. What do you think about Mathas? What strategy do you plan on building around him? Or did you think of something I missed? Let me know in the comments below. Looking forward to hearing from everyone. Thanks!